Potatoes are a semi-hardy vegetable that grow best in a sunny location. Plant potatoes 3 weeks before the frost date. Since they are a tuber, potatoes grow from “seed potatoes.” Seed potatoes look like regular potatoes, but they have not been treated to prevent sprouting, and they are certified to be disease free. It’s recommended that you purchase only certified seed potatoes, which can be purchased at a home and garden store, or local nursery. Let the potato seeds sprout. Then, plant the whole potato or cut them up and plant the pieces–just be sure each piece has 2-3 eyes and weighs at least 2 ounces. Set the cut pieces out and allow a crust to form before planting (a couple of hours to one day). Otherwise, they will just rot. Traditionally, potatoes are planted in rows and as the plant grows dirt is added to the sides, “hilling” around them. This is because between the seed and the top of the soil is the stem. Tubers grow from the stem, and that is where the potatoes develop. The more space you have under the soil, the more potatoes you will grow. 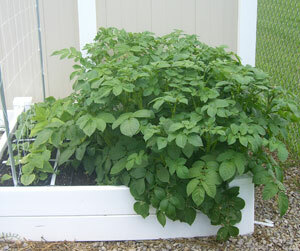 Believe it or not, you CAN grow potatoes in a square foot garden. You need to have at least 10-12 inches of soil to grow potatoes. 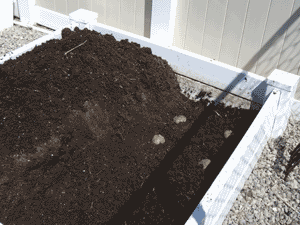 Simply take out the soil until there is about an inch or two left on the bottom. Plant one seed potato (or one piece) per square foot. Cover with about an inch of soil. As the leaves grow and come out of the soil, cover them up with more until the garden is filled to the top. And this is what they look like when they are growing. Potatoes grows best in a rich, well-draining soil; amend with lots of compost and fertilizer (chemical or organic) at planting and once during the season. Fertilizer: 16-16-8 at planting, 21-0-0 six weeks later. Too much fertilizer will lead to lots of leaves but few potatoes. 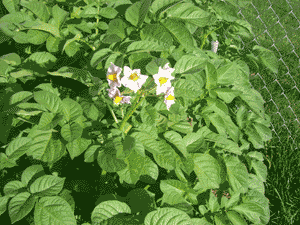 About 2 weeks after the potato plants flower, you can harvest “new potaotes” (small, thin skins). Or, wait until the plants die. Dig up the “late potaotes” (larger, tough skins) and brush off the dirt. Store in a cool, dark, dry place until ready to eat. Don’t wash until just before you cook them. Plant one seed potato per foot, you will harvest 4-10 potatoes per foot, depending on the depth of your garden bed. how many potatoes can be grew in a square foot??? Potatoes grow well in sandy soil – an Idaho farmer whose potatoes are sought by her entire community told me it is what sets her potatoes apart. Since my soil is clay and needs extensive amendment, I add sand to all my root plant areas of the garden – carrots, radish, onions. If your soil is firm, a little sand gives great results and much larger harvest. I made them. The vinyl rails I got were 5 1/2″ tall, I think. Read more here. Emily – did you purchase or build the white frames you are using in your sfg? If you built them yourself can give me some ideas about materials? I’ve considered using vinyl fence rails and post sleeves, but the largest rail I can find is 4″. My question has to do with Spring vs. Fall planting of potatoes. I would assume Spring planting would occure in March or early April. When could I expect to start harvesting? When should I begin Fall planting? Do they Winter over or do you harvest before major snowfall? Thank you for any clarification you can provide. Christie–a little longer than I expect. I planted my potatoes and worried they had rotted. Then suddenly they were up! I’d give it a little longer. If you can’t stand it, dig down a little where you know a plant should be (carefully!) and see if there’s any action. How long does it usually take for the plant to break through the ground? I planted two weeks ago and nothing is coming up yet. Thanks for your tips, I’m always unsure when to harvest my potatoes so reading your comments has really helped. My oldest daughter loves to help harvest potatoes, she said it is like digging for buried treasure. Wish me luck on a good potato harvest. Nicole–It’s too late now, just wait until the tops brown and/or fall over, then enjoy your harvest! I am new to sq. ft. gardening and purple potatoes. I planted purple potatoes in March and now at the end of May they are about a ft. 1/2 tall. However, I never did keep covering them in soil. Is it too late to do so or should I go ahead and harvest them and plant more? I am new to sq ft. gardening as well as purple potatoes. I planted them back in March but didn’t realize I should keep covering them in soil. At the end of May now they are a ft. and 1/2 tall. Should I go ahead and harvest them now? Or should I go ahead and cover them with soil? They are next to 2 sq. feet full of carrots. Thank you for any help you can give! You can cover the leaves over and over and over. Eventually you want to stop so your leaves will bush out and be a source of energy for growing potatoes. I would say 2-4 tires would do it. We are new at gardening, so I have lots of questions. We are going to try the tire method, and were just wondering is it too late to plant potatoes in Utah? If we do plant them this weekend, when will we have potatoes? About how many potatoes do you get off of one plant? And how many times can you cover the leaves? Potatoes do get tall (up to 36″) but I’ve never had to support mine. In an area with a lot of wind, that might help. But usually mine are so bushy, they nearly support themselves. I’m growing potatoes this year for the first time and they are growing. My plants are falling over. Should they be staked? Wendy–YES! As soon as the potatoes spring above the soil, cover them again. Cover them with as much soil as you can. Some grow them in trash cans, others add tires and soil. The space on the tuber between the seed potato and the top of the soil is where all the tubers will grow, and potatoes grow off the tubers. So the longer this space is, the more potatoes you will get. I feel like this is going to sound stupid, but I’m a little confused. You say when the leaves come up to add more soil… is this on top of the leaves and completely covering them? And how many times do you do this? My climate is roughly the same as yours in Lehi…is it getting to be too late to plant potatoes this year? Linda–it is tricky to share a garden bed with potatoes, since you have to take out nearly all the dirt at first. This year I’m dedicating a whole 4×4 bed to just potatoes. It’s hard to say how much I grew–I want to say 20 pounds or so. But I harvested them gradually, and didn’t keep tally along the way. 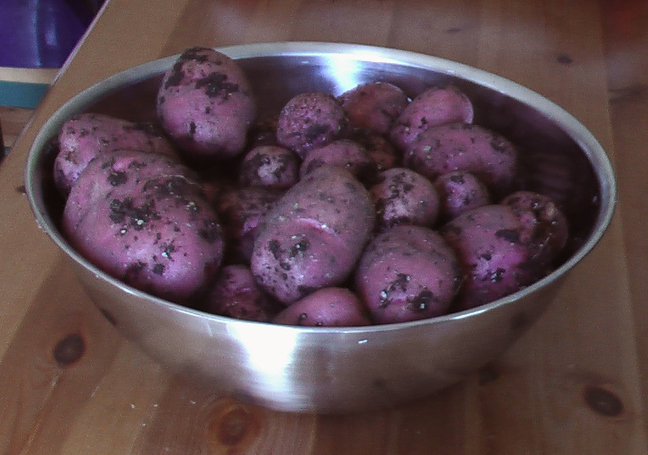 How many pounds of potatoes did your 2’x4′ garden yield? I have a few 4′ x 8′ beds. I’d love to have one full of potatoes. I assume you put the dirt in the half that you didn’t plant. Wish there was a way to utilize that part of the garden too, without removing the dirt from the bed. From the vantage point of the picture I planted 4 gold “on top” (in the 4 squares closest to the fence) and 4 red on bottom (in the 4 squares farthest from the fence). I haven’t heard anything about needing different conditions for different potatoes, but I’ll look into it! What do you mean gold potatoes on top and red potatoes on the bottom? I thought I had read somewhere that certain types of potatoes require different planting techniques. Can you explain the differences please? 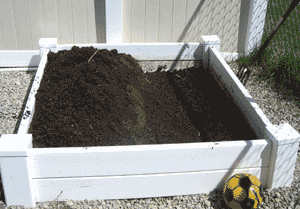 Kevin–the garden bed in the picture is 4×4, and if you look closely I’m planting in half of it–which is 2×4. I planted 4 gold potatoes on top, and 4 red potatoes on bottom (not pictured). One per square is appropriate, and you don’t need to thin them. I know it says one per square above, but it looks like you have 4 in a square. Is that for thinning. Thank you for the insight, Emily! We’re doing sweet potatoes and French fingerling this year – hopefully we have success! I planted some potatoes last year that had sprouted in my kitchen and ended up with diseased potatoes and tomatoes! I wouldn’t take a chance on it again. It was so disheartening to lose my beautiful tomatoes as well as the potatoes. And, if you do, be sure to plant them well away from tomatoes! You can, but there is a greater chance of disease. can you grow shop bought potatoes that are rooting? Or will they not produce well? Either way–I plant the potatoes whole, but if you cut them up just use one chunk per square. You indicate 1 per square, is that 1 of the cut potatos (with 2-3 eyes) in each square? Thanks for the clarification.